Learn more about the STEM Fellowship through the DRSC STEM Felows Video series produced by ThinkTV. Are you a PK-12 educator seeking sustained professional development in high-quality STEM Education? Our nationally recognized professional development model has been developed to support the evolution of your classroom offering with a focus on high-quality problem based learning experiences rooted in career connections, 21st century skills and collaboration. Our Educator Fellows have unique transformational experiences including building long-term relationships with local STEM Industry professionals and university professors through our collaborative 15-session model. As a result, our educators become members of a community of teacher-learners who share a common ambition to provide their students with rigorous and relevant classroom experiences that engage students’ minds and ignite their imaginations. 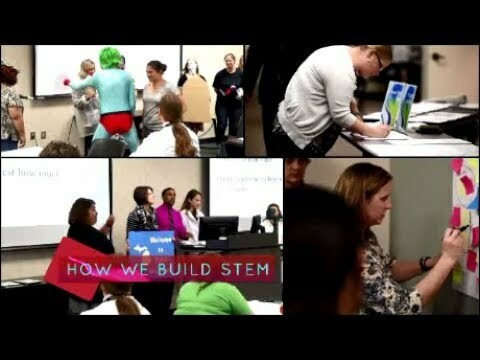 Past participants report increased student engagement; student-led experiences; student-explored career connections; authentic learning experiences; ability to create and implement differentiated instruction and assessments; as well as increased knowledge pertaining to STEM Education. If this sounds like an experience you are looking for, consider applying for the 2018-2019 STEM Fellows season professional learning community! 2019-20 STEM Fellows Application Packet will be available in Spring 2019. Please note: Applications will be accepted from May 16, 2019 – September 14, 2019. Fellow meetings are held on a rotating basis Wednesday evenings from 4:30-6:30 at Montgomery County Educational Service Center (200 South Keowee Street, Dayton). Interviews will be scheduled in the evenings. Fellowship notification will occur by the close of the month as the Fellow’s season commences in late October. See the 2018-2019 STEM Calendar for more details. Now seeking Higher Education, Government, and Industry Fellows. Learn more here. Fellowships are available for district, school, and private sponsorships at a cost of $4000. This is a competitive application process and it is recommended that 2-3 candidates participate in the interview process for every slot purchased. Grant funding may be available. Teachers selected through the interview process will become candidates for the Fellowship program. Teachers participating in the Fellowship program are eligible to receive a $1500.00 stipend for completion of program responsibilities. If you are an administrator or organization interested in securing slots for teachers or have general questions or concerns, please contact the STEM Director, Liz Wolfe-Eberly, at Elizabeth.wolfe@mcesc.org as slots are competitive and numbers limited.